L'Chaim - In Hebrew, "Life" - This is my life! 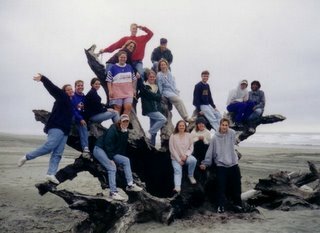 : MC Class of 97' - Beginning of the year retreat! MC Class of 97' - Beginning of the year retreat! This was an interesting day at our beginning of the year retreat. It was all a blur after that. Just kidding. I had a great year! Hard, but great. Out of my whole class I've only kept in touch with a few. I think most of my class is married but a few. I have no idea what happened to Mark Wohlers. It is a mystery. If anyone knows of his whereabouts I would love to contact him! Hey Leah! Thanks for leaving your comment on my page... it's great to hear from you. Of course I remember you! I even knew of you before we even met. My sister Heather had a picture of you up in her room. How funny is that? That's a hilarious profile picture.. that must be you as a kid?? haha! Well I hope all is well with you. Take care! Miss Leah just wanted to say hi, it was so nice to see you at Christa's wedding and bachelorette party hope everything down in good old roseburg is going good i love your blog! Hey Amber! It was good to see you too. I had lots of fun hanging out with the girls. I noticed you started a blog but it wouldn't let me leave any comments and I don't have your email address either. I need to get in touch with you. Help! Please write me back or I will try calling you. Love, me!